What’s almost as scary as Apple saying that they’ve run out of iPhone 5’s, forever?! Here are some suggestions to make your night of ghouls more exciting. It’s The Great Pumpkin, Charlie Brown iPad, iPhone and iPod touch ($4.99) Narrated by Peter Robbins, the original voice of Charlie Brown, “It’s the Great Pumpkin, Charlie Brown” features original voices, animations, and music from the 1966 television special. 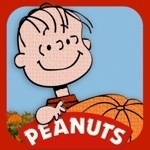 The app also debuts an entirely new customization feature that allows users to create and personalize their own PEANUTS character. With over a billion avatar and costume combinations to choose from, users can take their unique creations trick-or-treating with the PEANUTS gang. Users can also carve, paint and share their very own Great Pumpkin, play wartime songs on Schroeder’s piano, bob for apples with Lucy and Snoopy and make objects spring to life with a tap of the finger or a tilt of the page. Like all Loud Crow apps, It’s the Great Pumpkin, Charlie Brown includes both “read to me” and “read it myself” modes and provides educational opportunities by allowing readers to tap on an individual word to hear it read aloud. Tiny Talking Monsters Universal iPad, iPhone and iPod touch ($.99) Enter a magical world of Funny monsters. Hundreds of animations with two different and lovely Monsters. Play, dance, jump, talk and scare with them all day long. Biscuit Visits the Pumpkin Patch iPad, iPhone and iPod touch ($2.99) What will Biscuit find in the pumpkin patch? Watch and listen as the beloved yellow puppy searches for the perfect harvest pumpkin- and some fun surprises. Includes narration, animations, a fun sticker album where children can create their own Biscuit scenes and share them with friends, a colour book , and a bonus sniff out the hidden bone game throughout the story. The Scooby gang are invited to a Halloween party, but Scooby and Shaggy find themselves in a real haunted house and need your help to find all the hidden Zoinks Points and solve puzzles. The app includes word highlighting, read-along options with narration and includes the option for parents to record their own voice reading the story. The Walking Dead iPad, iPhone, and iPod touch (Free) Read the blockbuster comic series that’s now a hit TV series. The first issue is free, and the rest are via in-app purchase. Frankenstein, for iPad iPad, iPhone and iPod touch ($4.99) A new, interactive adaptation of Mary Shelley’s classic novel.